So, have you seen this epic rant pop up on your Facebook news feed lately? Hold onto your hats… SPOILER ALERT: it’s all about how to keep your photos, likes, and comments private on Facebook! Please do this for me. Once I see it on your wall, I’ll do it for you. I’m a pretty public person, but I really don’t want everyone in the world to know what I ‘like’ etc. It’s just annoying, too. 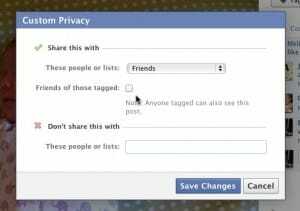 Facebook has changed their privacy settings once more!! Due to the new “graph app” anyone on facebook (including other countries ) can see your pictures, likes & comments. The next 2 weeks I will be posting this, and please once you have done it please post DONE!!! Those of you who do not keep my information from going… out to the public, I will have to DELETE YOU! I want to stay PRIVATELY connected with you. I post shots of family that I don’t want strangers to have access to! 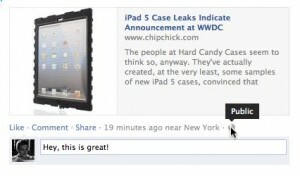 This happens when friends click “like” or “comment”….automatically, their friends would see our posts, too. Unfortunately, we cannot change this setting by ourselves because Facebook configured it that way. PLEASE place your mouse over my name above (DO NOT CLICK), a window will appear, now move the mouse on “FRIENDS” (also without clicking), then down to “settings”, click here and a list will appear. REMOVE the CHECK on “LIFE EVENTS and “COMMENTS & LIKES”. By doing this, my activity among my friends and family will no longer become public. Now, copy & paste this on your wall. Once i see this posted on your page, I will do the same. Thank you. Yes, it’s true that Facebook’s constantly changing its features and privacy policies—so often, it seems, that it’s almost impossible for me to keep up. But if you want to keep your comments and likes from spanning the globe, merely asking your friends to hide them from their news feeds (and make no mistake, that’s all that happens when they uncheck items from their personal news feed settings) isn’t going to cut it. Make sure to double-check the Facebook “audience selector” before you post an update. Indeed, it’s easy to forget the little “audience selector” that sits at the bottom of the “Update Status” box. Its default setting is … well, whatever it was the last time you posted something, meaning it’s entirely possible you’ve been inadvertently sharing all kinds of updates and photos with the entire world. So, next time you post—or actually, every time you post—check that little audience selector and make sure you’re only sharing with those you really want to share with. Sure, it’s fun to sift through the group photos you post on Facebook and tag all those familiar faces. Make sure to uncheck “Friends of those tagged” if you don’t want your tagged Facebook photos spreading far and wide. By default, though, Facebook will share a tagged photo not only with the friends you tagged, but also all of their friends, whether you’re friends with your friend’s friends (confusing, right?) or not. The good news is that there’s a little-known setting that’ll keep the photos you’ve tagged from spreading far and wide. Open the photo you posted, click the little audience selector, then select “Custom” from the drop-down menu. Whenever you click “like” on a friend’s post or chime in with a comment of your own, you’re basically at the mercy of your friend’s privacy setting on that particular post. Don’t want the world to see your Facebook comments? Then don’t comment on a public post. Even if the post’s audience selector is set to “Friends” rather than “Public,” remember that those friends include all of your friend’s Facebook pals, not just necessarily just your buddies. Indeed, it’s best to think of a friend’s Facebook post as a group conversation at a party; if you chime in with a comment, everyone else participating in the chat—friends and strangers alike—will hear it, too. Dying to comment on a friend’s link, but uncomfortable with how many people your friend is sharing the post with? 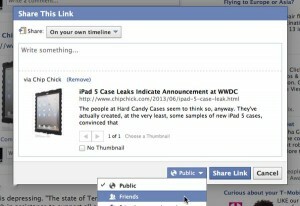 You can share a friend’s photo or link on your timeline, complete with your own privacy settings. You can always click “Share” at the bottom of the update, then post the story to your own timeline with your own privacy settings. Just don’t forget to select the setting you want from the drop-down menu in the bottom-right corner of the pop-up window. No matter how carefully you check your privacy settings, there’s nothing stopping a careless Facebook friend from, say, sharing one of your photos to their wall and making it public. So if you really want to keep a snapshot or a comment from circling the globe on Facebook, here’s my advice: don’t post it on Facebook.